Do you recognize this unique scene? Something wrong with it? Photo/Essay: #9-Part 1: BACKPACKING 2012–SCHEDULE and PREPARE OR ELSE…….! 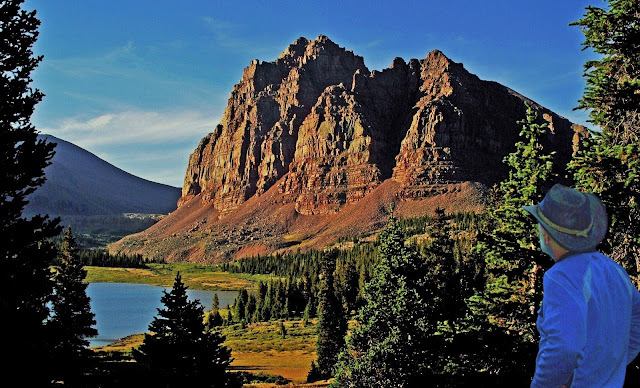 To report accurately I made a quick trip up the MIrror Lake Scenic Byway–Utah Highway 150 on Saturday, May 19th, to be able to report to all my High Uinta Friends. Below are a set of photographs, some of them partnered up with similar shots taken on June 28, 2011. You should all recall that 2011 was a heavy snow year and the Mirror Lake Highway didn’t open until June 28th, but with a lot of snow. That made backpacking access very difficult until late July. As you can see it is much different this year. Actually the Highway was open about a week ago. Up the highway we stopped to observe Teapot Lake with ice breaking up. Notch Pass is seen in the distance. Next we come to Lilly Lake the above portion on the north side of the highway. There were a few fisherman. The high point on the highway is Bald Mt. Pass. On the left in 2011 there were 4 foot drifts still. Today, 40 days earlier, almost nothing. Over the pass we pulled out to view Moosehorne Lake below with slushy ice still, with Hayden Peak on the left, and Mount Agassiz on the right. We are looking east towards Mt. Agassiz, the Naturalist and Four Lakes Basins, and Cyclone Pass. As we head north towards Hayden and Agassiz peaks we can’t help but notice little snow. In fact the difference is stark! Backpacking will be possible easily by mid-June in some areas. From Mirror Lake, that still had slushy ice on it, we climb towards Hayden Pass and stop to get a shot of Butterfly Lake that looks about the same as it did last year on July 8th. We went as far as the Highline Trailhead, the most famous and most used in the Uintas. It looked about the same as on July 8th last year. No access yet to the parking lot, but I suspect it will be clear of snow by early June. I hope this report has been of interest to you. I now have to go to work and do PART 3 of the series I have been doing to help us all get ready for the backpacking season. It will deal with GEAR. I’ll do my darndest to get it done before I report in for my surgery on May 24th–and thus have my backpack ready for my first backpack. We all need to have GOALS and boy have I got them. Make out a list of your’s and work on them. The NEW OBSTACLE I mention in Part 2 has me putting on hold Part 3. Give me a week or so. 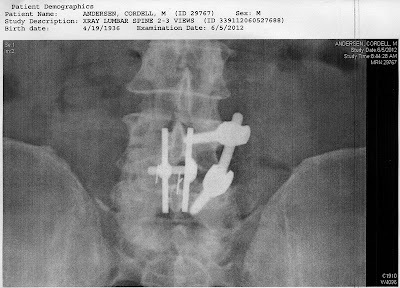 UPDATE: April 20, 2012 Scroll down to see what the specialists concluded and the treatment that will have me overcoming the “obstacle” and backpacking still in my 77th year. May 16th UPDATE: “overcoming the obstacle” got a bit more complicated, so it looks like the“backpacking still” will mostly be this old guy doing it in my 78th year! “I’m going under the knife” as there is too much of me still working pretty good TO GIVE IN! May 17th UPDATE: On May 24th I will undergo surgery for my “degenerative lumbar spinal stenosis.” That translated to High Uinta geezer English is: “I’m a worn out old guy!” Recovery can take as long as 12 months, but knowing me, the Dr. thinks I might be ready to backpack by August 24th. I’ll apparently be in the hospital at least 3 days, then a week or so of bed rest at home, and then gradually get back in shape and hope to at least do what I have listed as my first trip for this summer. I will do my darndest and see how it goes. While I recuperate and recover I’ll be doing all the research I need to put all this together, but before the surgery I’ll do PART 3: GEAR so that it might be in time to help all of you with a suggestion or two.. and then I’ll keep you updated on things like the Mirror Lake Scenic Byway opening, and do some YouTube videos and photo/essays on a few of the fascinating historical aspects of the Uintas you probably don’t know about, etc. 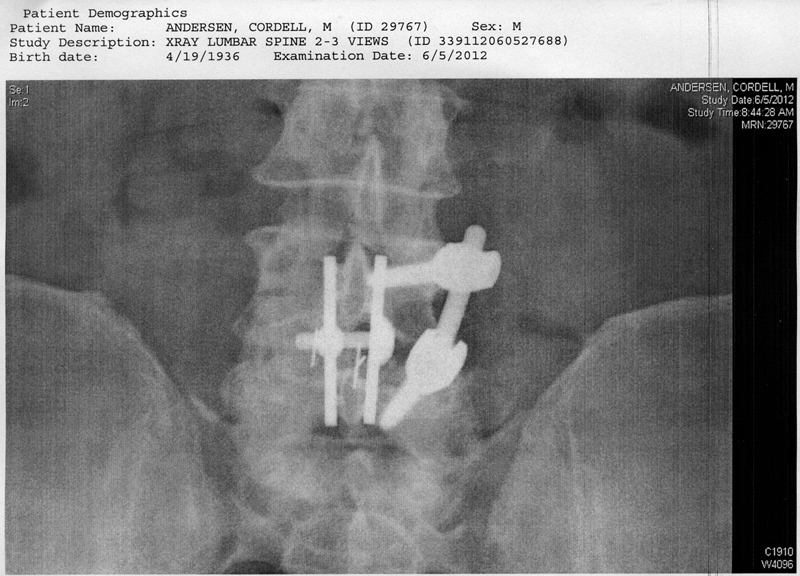 “Transforaminal Lumbar Interbody Fusion L4-L5” was done on May 24th. I returned home on the 26th with instructions to not bend over, twist, or lift anything. By my first post-surgery visit on June 5th I was afraid I had exercised too much and maybe done some damage, but the x-rays showed all was fine. I’ll insert an x-ray below showing the titanium thing-a-ma-jiggs installed in my spine to keep things straight until bone grows up to make me strong again. In spite of the pain, etc. Dr. Richie still believes I will be able to backpack by late August. I have good days, and bad days, one of my daily walks being to REAMS “where everybody knows my name.” It’s my CHEERS! Yesterday, a painful day with difficulty sleeping, had me finally at midnight seeing a DVD my son David gave me–“127 DAYS,” WOW! Aaron Ralston did everything wrong to get himself into his impossible situation–but what he did to survive will stop me forever from whining about a little pain. I was doing fine with my recovery for about 2-3 weeks when I had increased my daily walking, twice a day, to a total of as much as 6 miles. But then left leg pain and weakness took over and the Dr. suspected that my persistence at continuing to work with pain for 3-4 months possibly caused nerve damage. He told me to back off on the exercise and re-evaluate at my July 17th visit. I was in tough shape for that visit, and today as I report. I did go through a couple of weeks of hell to get off the narcotic pain killer and sleep aid prescribed by the Dr. and am struggling to get along with over the counter pain killers. My doctor and the radiologist concluded from the scan that everything is normal and that I should experience a full recovery. I just have to be patient and very careful with walking and exercise as apparently there was nerve damage and being an old guy now has recovery happen in slow motion! That for sure will have me waiting until August 2013 to accomplish the four trips planned for this summer and give me enough time to learn to walk all over again and have sufficient strength to get the job done. I’ll insert two print outs below from the scan the doctor gave me.